The instant messaging program Pidgin 2.10.9 has been released recently. It mainly fixed problems logging into some servers including jabber.org and chat.facebook.com. The default Pidgin versions in Ubuntu universe repositories are quite old (See Pidgin changelog history). 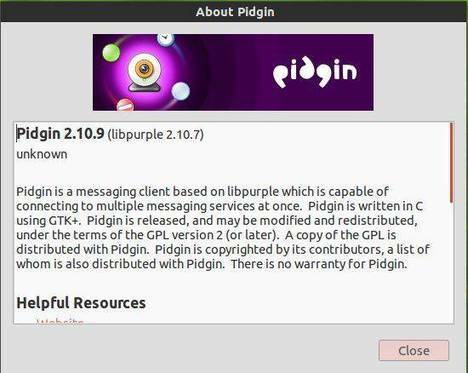 The Pidgin Developers PPA provides the most recent version of Pidgin for Ubuntu 14.04, Ubuntu 13.10, Ubuntu 12.10, and Ubuntu 12.04. Here’s how to add the PPA and install / upgrade your Pidgin from it. For the Off-the-Record (OTR) plug-in, which is designed for use with Pidgin ensures authenticated and secure communications between Pidgin users, just search for and install pidgin-otr from Ubuntu Software Center. Finally enable the plugin from Pidgin menu Tools -> Plugins. Although i had a issue, while connecting to my office network, with ubuntu 14.04. I used to connect well, when i had ubuntu13.04 installed. I was using Office Communicator protocol at that time. Recently i upgraded my ubuntu, and reinstalled pidgin. But this time “Office Communicator” does not show up as a protocol option. It doesn’t work. I’ve tried over a dozen times and it doesn’t work. Ji M , add otr instructions pls (pidgin without otr is useless) _ thx. Pidgin does not work with ICQ, Keeps telling me that have an incorrect password which I know is false.